Coach Gehrke is a true definition of a Coach. He spent 26 years with one organization - Schwäbisch Hall Unicorns of Germany, turning the organization into a power house. Coach Gehrke announced his retirement recently, however, we wanted to talk to him about his career, as well as, some of the advice he'd give to young coaches. I started playing when I was 18 years old. One year later, my club established a youth team and I became their coach, mainly because I played quarterback and therefore knew most about the theoretical part of football. For seven years I played on our senior team and coached the juniors, then I took over the head coaching position of the seniors in 1991. Until then we had drawn our coaches from the US military base in Schwaebisch Hall, with a high turnover because of redeployment and things of that nature. So in 1991 we decided to go for more stability in coaching by appointing me as the head coach. Comparing European football in the 90s with today, I would say the technical aspect of the game has improved a lot due to the much better education of coaches that we have nowadays. My first four season at the helm were pretty rough. At that time, the military installation in our town closed down, which deprived us of American players. Within a few seasons, we went down from the second to the fourth league in Germany. But then we started to rethink our approach and got more professional in a number of ways, and that put us back on the success track. When I took over as head coach I was still attending university, and when I graduated I briefly considered becoming a full-time football coach. But I decided against it because of job security concerns, and instead became a high school teacher. However, I knew I wanted to continue coaching and I also knew the place to build something would be my home town. So starting in 1995 we got things turned around and ascended from fourth to first league (GFL) by 2001. The first few years in the GFL were moderately successful for us - even though we reached the playoffs every year but once - but things really took off in 2011. 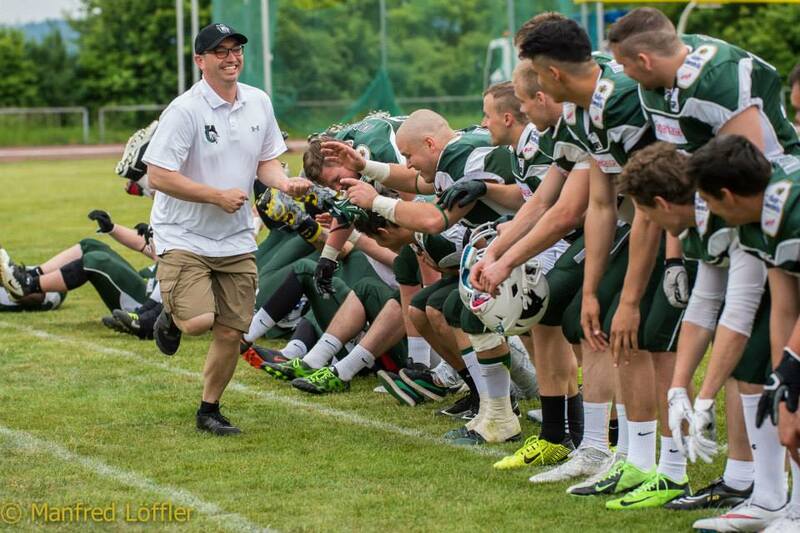 We managed to play a perfect season and win a wild German Bowl against the Kiel Baltic Hurricanes, so of course this last-second victory ranks as one of my most memorable moments with the Unicorns. Through all those years we also had a very successful junior program, and when they won the Junior Bowl in 2016 in our home stadium this was another elating experience, especially because my son was part of the championship team. The good thing about being with the same organization for a long time is that you really get to "run the show", you are able to control a lot of things. After a while people will follow your lead rather easily and you don't have to worry so much whether your ideas will be approved by players and board members. Of course you still have to take their input into account, but it's just not as difficult as it can be for someone new to the program. The main thing I learned over time is that I am not as clever as I thought I was. Young coaches tend to feel that they have found a secret key to success, and I guess I was no different. But over the course of time you learn that there are many ways to skin the cat and that it is not so much what you do, but how you do it. The one thing I stayed true to through all my years of coaching was that I tried to put the players first, I always felt it was my main job to serve them and make football a positive experience for them. I never really scouted German players because we mostly went with the guys that came up through our junior program. If anything, I would try to get players to join us that I had met on the field somewhere and of whose personality I therefore had a pretty good idea. Character was always more important to me than performance, even with imports. We often went with division 3 Americans, because they were generally just a good fit for us as a small-town, relatively low-budget, but family-oriented club. When looking for imports, statistics did play a role, but we would never take a player without having heard or read things about him that supported his quality of character. If you don't want stars to be an issue on 2your team, you have to make everybody feel that they are "just" a small part of a team, but at the same time everybody is integral to team success, even guys who don't play much. Coaches should avoid giving special treatment to their best players. It's okay to let them know they are the best ones, but that doesn't mean others are less important. Patience and persistence got the Unicorns to where they are today. You cannot achieve sustained success very quickly, and you must keep grinding. This may not seem like a lot of fun, but it actually is!